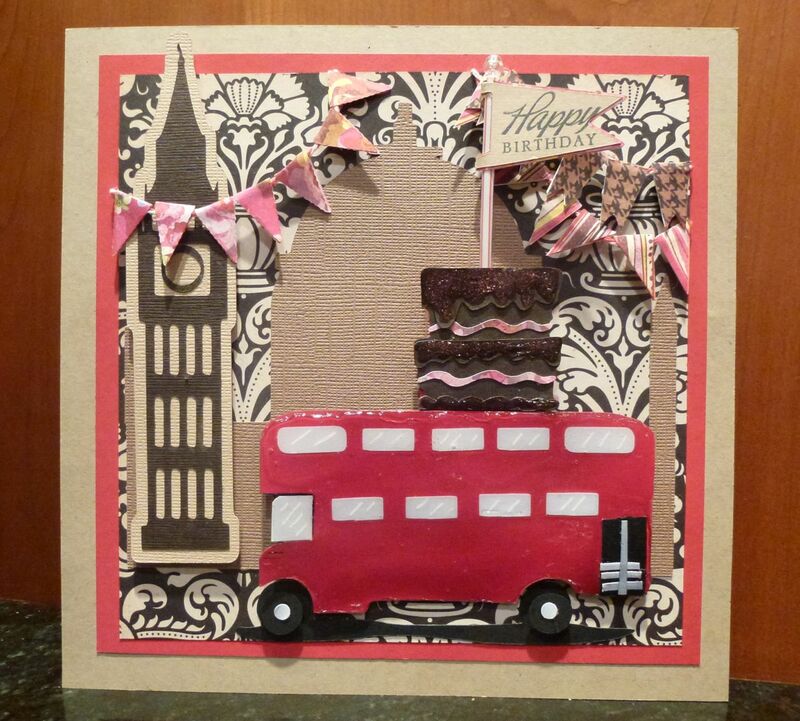 This is a birthday card for London’s mom. When I went to make this card, I could only locate Big Ben (featured on the left from the Destinations cartridge) in my collection. But the iconic image of London, that red double decker bus, was not available. As a result, I experimented with the school bus on Nate’s ABCs – and managed to turn the school bus into a double decker bus through welding some basic shapes in the Cricut Craft Room (and some from Nate’s ABCs). The steps at the rear of the bus and the pole were hand cut and the hub caps are a Crop-A-Dile punch just to make life a little easier. However, all the rest of the bus was cut courtesy of my E2, Nate’s ABCs, and the Cricut Craft Room. Once I finished with the bus, I decided to add some background silhouette scenery and once again used Cricut Craft Room to build St Paul and Admiral Nelson’s Column from Trafalgar Square from the same cartridges as the bus. The birthday cake is from Birthday Bash (minus a cat) and the pennants all came from a digital cartridge – Party Picks and Pennants. The pennant, with a PTI sentiment, topping the cake is flying from a cocktail straw attached to the back of the cake. I inserted a corsage pin inside the straw in order to provide a little glitz at the top of the pennant. It’s a substantial card – good thing I don’t have to mail it. Sooo cute! Love that you were able to make the double decker bus! Wow! How clever to create a double-decker bus. Again, I am so impressed that you are becoming a CCR expert! The collaged items are just perfect and the pink pennants make it perfectly birthday-ish! Perfect cake with that glossy, sparkly, dimensional icing too! Love your use of the negative space! Awesome card! Love all that work you did in CCR :D.
I hope people read this and see how amazing a tool CCR can be. So many resistant to change. Change is good…not perfect, but good. I missed the pin in the MB post….I certainly do love that element of bling! You did such a great job creating this bus….I can’t believe it’s started it’s life as an everyday yellow school bus. We should all live up to such potential! I love this creation, especially how you’ve personalized it so. Fun, fun, fun!